Join us online for our monthly women's networking series, After 6: Career Conversations. 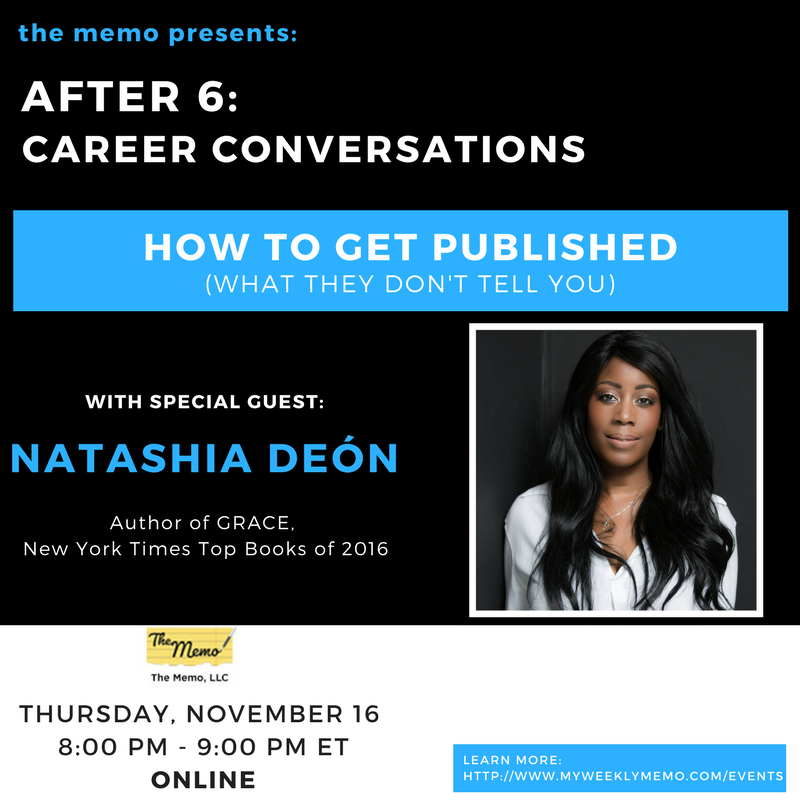 This month we are discussing How To Get Published, with our special guest author, Natashia Deón. After 6 is a chance for you to connect with other like-minded women. Natashia Deón is a 2017 NAACP Image Award Nominee and author of the critically-acclaimed novel, GRACE (Counterpoint Press), which was awarded the 2017 First Novel Prize by the American Library Association's Black Caucus (BCALA), was named Kirkus Review Best Book of 2016, a New York Times Top Book 2016, a Book Riot Favorite Book of 2016, The Root Best Book of 2016, and an Entropy Magazine Best Book of 2016. Her writing has appeared in American Short Fiction, Buzzfeed, LA Review of Books, The Rumpus, The Feminist Wire, Asian American Lit Review, Rattling Wall and other places. A practicing attorney, law professor, and creator of the popular L.A.-based reading series Dirty Laundry Lit, Deón is the recipient of a PEN Center USA Emerging Voices Fellowship, and has been awarded fellowships and residencies at Yale, Bread Loaf Writer's Conference, Prague's Creative Writing Program, Dickinson House in Belgium, and the Virginia Center for Creative Arts. She has an MFA in Creative Writing from the University of California, Riverside--Palm Desert.